You said it, Phi, not me. I concluded my thoughts on the amazing Nine Hours, Nine Persons, Nine Doors by noting that I’d started its sequel, Virtue’s Last Reward, but had found it relatively uncompelling. A couple of friends subsequently encouraged me to push past its slow start, and it did grow on me, enough that I ate through the whole thing — all 40-odd hours of it. I leave the experience mostly interested in how a sequel can misunderstand what made its predecessor great, and the entertaining but entirely lopsided failure than can result. I’ll catalogue the good parts first. As with Nine Hours, this game originally targeted the Nintendo DS, and received a modern-console edition last year within a collection titled The Nonary Games that adds interface improvements and fully voice-acted characters. Also like the previous game, one voice-actor’s performance really stood out for me: this time, Cindy Robinson’s portrayal of Zero III, the gleefully sadistic game-master who manifests as a holographic talking rabbit. Had I only read his lines as text on a DS, my mental voice for Zero would have sounded like a generic giggling maniac. This newer edition brings him to life through a woman who freely rips up and down an amazing and delightful comic range, and in key moments elbow-drops into lights-out terror. So good. I ended up falling into a pattern of enjoying Last Reward the way I might watch a mildly interesting TV series. While not immediately obvious, the game’s structure encourages this episodic approach: unlike Nine Hours’ small and tightly tangled flowchart, Last Reward presents you at the outset with an enormous and perfectly symmetrical story-tree. It branches three times and then thrice more, resulting in a mid-game of 9 clear-cut episodes, and I felt comfortable getting through one per play-session. Each of those has a “good” and “bad” ending to find, and when you mix in the prologue and endgame material, you end up spending dozens of hours with this game. While I did stick with it, I didn’t find Last Reward’s story anywhere near as interesting as I did its structure, let alone the story of its predecessor. Both games’ plots are complete nonsense, but Nine Hours embraced it by couching its absurdities within a framework of real but wonderfully obscure mid-twentieth century pseudoscience, laying them out with truly enthusiastic detail and endearing itself completely with me. The story of Last Reward, on the other hand, revolves around blandly pedestrian time travel and “quantum mechanics” hogwash that, I expect, most any adult consumer of modern popular entertainment has seen many, many times. 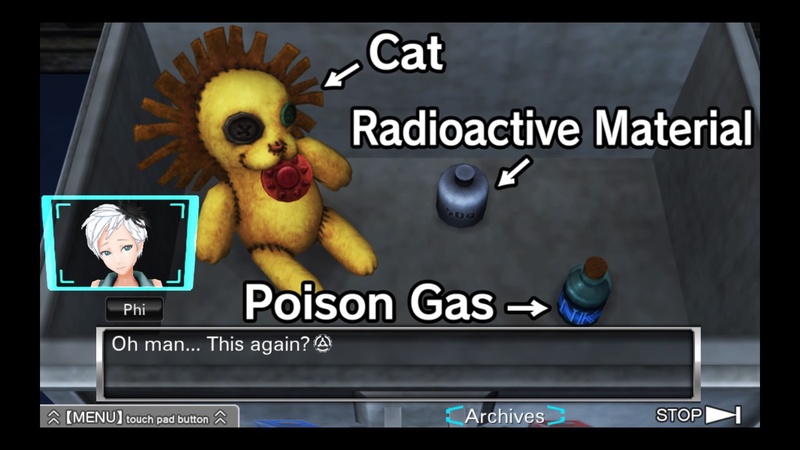 Nothing illustrates this better than the game’s embarrassingly drawn-out teasing of Schrödinger’s Cat, treating the thought experiment as a delicious mystery that the player-character strives to learn more about, rather than as a long-established facet of modern popular culture. The game seems to lampshade this laughable disconnect by having another character express confused surprise at the protagonist’s ignorance — and then proceeds to launch into a lengthy slideshow on the topic anyway. A pale shade, this, of Santa and Lotus holding forth in Nine Hours about psychic crystals and morphogenetic fields. The game also suffers a mismatch in the stakes its characters face versus those presented to the player. Exploring about one and a half of the flow-tree’s nine main branches makes clear that the player can safely and quickly revisit any choice-point, taking the previously untraveled path without erasing progress made downstream. This means that the crucial choices that the characters agonize over — what combination of people to bring through which doors, and how to vote in the Prisoner’s Dilemma matchups that define the game-within-the-game — make no difference to the player at all, deserving very little of their attention, even though each of the nine iterations is distinctly (perhaps even wastefully) voice-acted and painstakingly illustrated with circles and arrows on the back of each one as characters argue about possible outcomes. Like Dio, I feel like I made my own fun with this game. And this carries, unfortunately, to story beats: certain turns of events do surprise and interest the first time they happen… but then they happen a second and a third time, I couldn’t escape a sinking feeling with the realization that six more iterations of each one awaited me. A non-interactive movie about a person with supernatural deja-vu of this sort would start depicting it in short-hand as the audience catches on. Groundhog Day, for example, quite effectively expresses its protagonist’s subjective experience even though it limits its runtime to only two hours out of his own umpty-thousand. Last Reward, though, plays out each repetition in real time. Perhaps I would have felt less annoyed had I discovered sooner that I could enable a “Skip all” feature through the game’s options menu. Once I did — well into the final third of my mid-game slog — I fast-forwarded over the long plateaus between known-unique sections with no regrets. 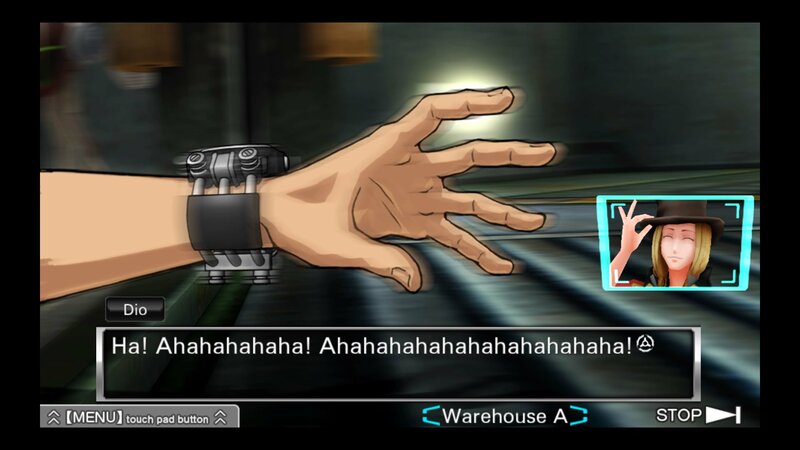 In the end, Virtue’s Last Reward feels to me like its designers took the wrong lessons from what made Nine Hours, Nine Persons, Nine Doors great. “Players loved the flowchart you could jump around in order to influence other branches? Great: let’s not only make it three times larger, but overtly center both gameplay and the storyline on jumping all over it!” And sure, that might have worked, but it seems implemented here at cost of a compelling story or memorable characters, to say nothing of Nine Hours’ loopily original way of presenting both. FYI, I thought the third one was better than the second, but leans even harder into playing with the branching structure. Ooh, thanks. I scored it as a free download for my Vita last month, and of course I can’t find my Vita. Ridiculously considering buying it for PS4 anyway.